We’ve covered keeping warm and staying fuelled up in part one of our ‘Cycling in the winter’ blog, but winter brings further considerations for your bike itself. It’s worth taking some extra time keeping things in top condition or swapping things out for the change in conditions a wet and cold winter can bring. Lights: On overcast and grey winter days it can be exceptionally difficult for motorists to see you on your bike. Maximise your safety by investing in a set of bike lights, front and rear. They don’t need to be expensive, there are some great, well priced, LED lights available which are small, unobtrusive and very often rechargeable via USB. Tyres: With wet gritty roads the potential for punctures goes up significantly, if you’re riding a lot it’s well worth buying a set of slightly heavier duty tyres, something with a puncture resistant layer under the tread. What you sacrifice in weight and rolling resistance you’ll more than make up for with all the time that you won’t spend stood at the side of the road (normally in the rain) with numb fingers trying to fix your puncture! You may also want to consider a slightly wider tyre, the larger contact area will provide added grip on greasy roads, the extra comfort is a nice bonus too. Tread pattern/existence divides opinion, with a strong argument suggesting that the contact area of a tyre is too small for a tread to have an effect. However being relaxed is one of the biggest things that’ll help to keep you upright when things get a little sketchy so if a tread gives you more confidence and a little peace of mind that can’t be a bad thing. Mudguards: You may not like the look but your riding friends and club mates will love you for these. Nobody enjoys the constant spray from a fellow riders back wheel so without these you’ll be relegated to the back of the line and no one likes a wheel sucker so it’s a double whammy. As well as protecting others, mudguards will keep you cleaner and dryer for much longer and also prevent all that road grime being fired directly into your drivetrain and brakes helping your beloved bike to last much longer. If your bike doesn’t have mud guard bosses (most race frames don’t) it’s no longer a problem. Various manufacturers make clip on mudguards specifically for road frames. SKS Raceblades and Crud Guards are two great examples. Brake Pads: Keep a close eye on your brake pads, the dirty roads and constant spray of grit and grime will greatly increase wear to your brake pads. If you do a lot of winter riding expect to get through pads much quicker. Rims: Your rims will wear in exactly the same way as your brake pads so try to keep everything as clean as possible to minimise the effect. Keep an eye on your rims, if they become too worn and the brake surface too thin you risk a wheel collapse. If you have a favourite/expensive pair of race wheels it might well be worth putting them away for the winter and swapping them out for a cheap low end wheel set you can abuse to your hearts content. Keep it clean! As with your wheels and brake pads the rest of your bike is vulnerable to added wear and tear throughout the winter. Clean and grease your bike regularly, particularly the drivetrain as this will wear very quickly. A good quality chain cleaner like the one made by Park Tools will make this messy job easy efficient and clean. A clean quiet bike is faster and a joy to ride. Winter Bike: If you’ve invested a lot of money in your dream race bike, and have the space to store one it might well be worth considering a second bike for winter use. A cheap alloy frame with mudguard and rack mounts makes the perfect winter training bike and commuter. It might be heavy but that just adds to the training effect, Just think how good your race bike will feel in the spring! Winter Wheels: A budget wheel set so you don’t trash your best race wheels. Chain Swap: If you’re running a high end group set chances are you have an expensive lightweight chain. This will wear very quickly and in turn eat into your cassette and chainrings. Consider purchasing a low end chain and swapping it regularly, this will be far cheaper in the long run than having to replace your entire drivetrain! 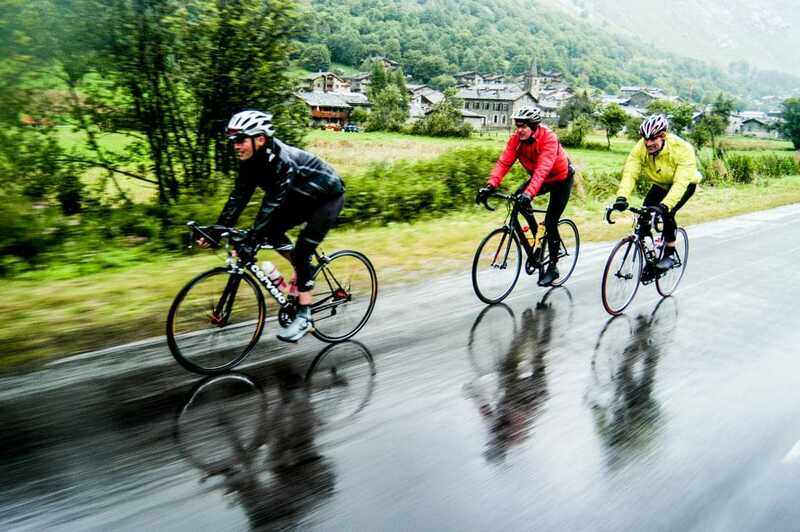 If you’re planning a trip to the alps in the future, read our 8 essentials for road cycling in the alps and get in touch to chat about our day trips and tours.